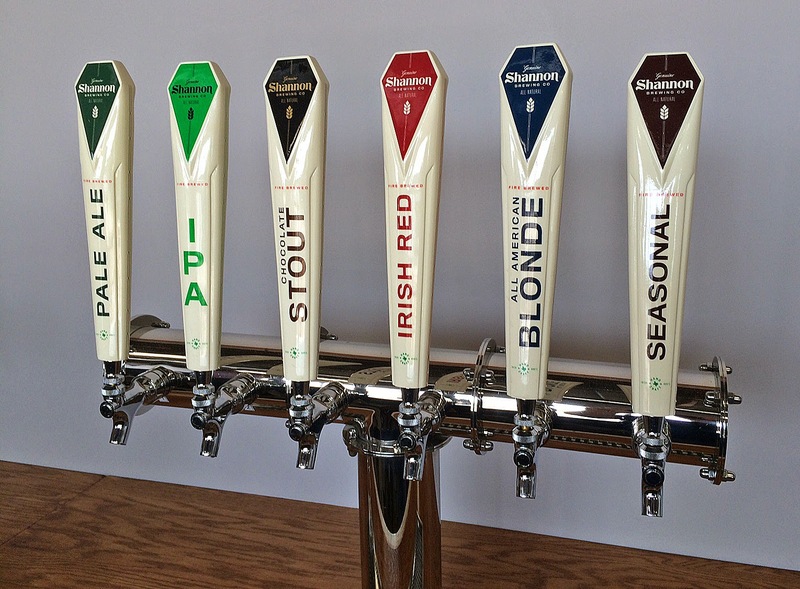 After more than a year in development, the Shannon Brewing Company is in the final stages of preparation for the upcoming debut of the brewery in Keller. Coming off a soft-opening this past weekend, founder Shannon Carter and crew will spend the next couple of weeks refining things in terms of how they'll run the taproom and tours leading up to the official unveiling. Construction began on the 6500 square foot structure housing the brewery back in January, with subsequent delivery of the brewhouse occurring in April. As has been mentioned here before, the 20-barrel system utilizes a direct-fire brew kettle and mash tun designed to follow an Old World process dating back the 1860s employed by Carter's great-grandfather in Ireland. With it, Carter will brew double batches in order to fill a set of 40-barrel fermenters which round out the set up. For more details on the history behind his approach and a complete overview of the brewing process see the brewery's website: http://shannonbrewing.com/fire-brewed. The building itself sits on a sizable 3-acre tract of land, which is part of a larger expanse the brewery shares with the Samantha Springs Bottling Company. Water from the springs will be fed directly into the brewhouse, and will remain untreated for use in all but one of the brewery's beers. Carter says the lone exception will be Shannon Chocolate Stout, for which he'll make a slight adjustment to enhance the flavor profile of that particular beer. Regarding the overall space, Carter would seem to have more room to work with than any other brewery in the immediate Dallas/Fort Worth area. In addition to a climate-controlled indoor taproom, featuring a bar constructed from reclaimed materials, he's built an outdoor beer garden adjacent to the main building. This is surrounded by a planter that will be used to grow hops on site come springtime, which will be irrigated by harvested rain water collected by a tank stationed nearby. Remaining outdoor space will provide ample parking for now, but it could be used for further build-outs should production needs dictate such a move in the future. Carter also envisions hosting festivals and other large-scale events to take further advantage of the size of the property. The brewery will open with five beers in production, with seasonals to follow. Beyond the stout and his flagship Pale Ale, Carter will brew an Irish Red, an All American Blonde and an IPA. All are expected to be available on opening day, and since the brewery will be operating under a brewpub license, packaged products will be offered for visitors to take home. Carter has acquired a 4-head bottler which he'll use to fill 22-ounce bombers for sale in the taproom. These, along with kegged beers, will also be distributed to draft and retail accounts within limits set by the TABC for this type of operation. Initial plans call for the brewery to be accessible during taproom hours on Thursdays and Fridays, with the open house/tour model being implemented on Saturdays. Carter also intends on making the brewery available for rentals. Taproom amenities are expected to include widescreen TVs and free Wi-Fi connectivity. Food trucks will be on hand for tours, while catering from off-site restaurants can be arranged for private events. As for the aforementioned debut, a Grand Opening celebration will be held on Saturday, September 20. Running from 12 to 4 p.m., the cost for the event will be $10 per person, which includes three pints and souvenir glassware. Other opportunities to sample Shannon beers will come with your admission to either of two upcoming festivals. The brewery will be pouring at the Dallas Observer Brewfest on September 13, as well as at the Texas Craft Brewers Festival in Austin on September 27. Follow Shannon Brewing on Facebook and Twitter.